Tedeschi Trucks Band, the unstoppable GRAMMY-winning 12-piece musical juggernaut led by husband and wife Derek Trucks and Susan Tedeschi, have announced their new album ‘Signs,’ out February 15th, 2019 on Fantasy Records. Featuring 11 new original songs, the album expands on the group’s omnivorous musical appetites, while facing down troubled times with credence and conviction. The group’s world-class musicianship is on full display in the genre-defying collection that runs the gamut from uplifting soulful anthems to bittersweet ballads and driving rock and roll. ‘Signs’ was a true band effort, with each of the supremely talented twelve members playing a major role. 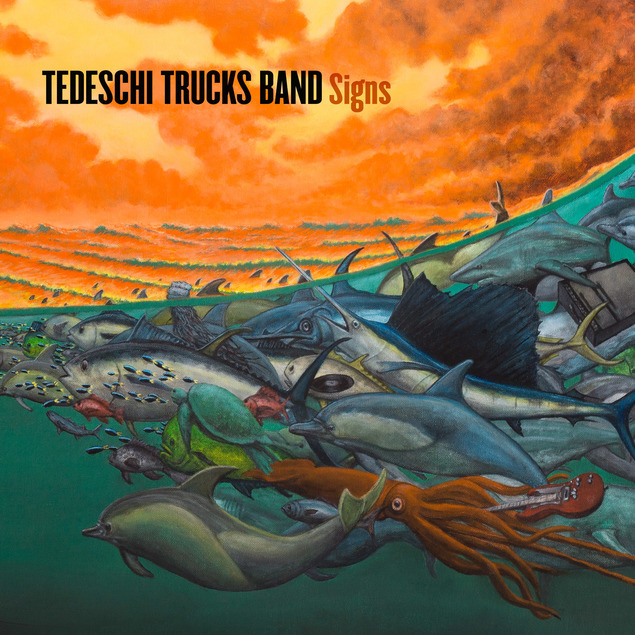 As with its predecessors, the album was recorded in Tedeschi and Trucks' backyard studio Swamp Raga, with additional contributions from trusted TTB brethren Warren Haynes, Oliver Wood, Doyle Bramhall II, and Marc Quiñones. Trucks shared production and engineering duties with Jim Scott (The Rolling Stones, Tom Petty) and Swamp Raga studio engineer Bobby Tis, and the band recorded live to two-inch analogue tape for the first time, using their original Neve console combined with a 70's Studer tape machine. A sense of loss and frustration colors portions of ‘Signs.’ A number of tragedies hit home during the writing and recording of the album, as the group said goodbye to family members and friends including Derek’s uncle and Allman Brothers alumnus Butch Trucks, founding Brother Gregg Allman, and mentors Leon Russell and Col. Bruce Hampton. Political polarization, intolerance, and threats to an environment they see as increasingly under siege are also dealt with openly and honestly on the album. Tedeschi Trucks Band will celebrate the album’s release with a performance at The Brooklyn Academy of Music on February 20th. The special one-night performance follows a string of multi-night residencies at the Chicago Theater, Nashville's Ryman Auditorium, the Saenger Theater in New Orleans and the Warner Theatre in Washington, D.C. – and marks the band’s first return to New York after their sold-out, six-night residency at the Beacon Theatre in October, which has become a highly-anticipated fall tradition for the band. Tedeschi Trucks Band will continue to tour through 2019, including a spring run of shows in Europe, a return to the west coast, and their 5th annual Wheels of Soul tour this summer featuring special guests Blackberry Smoke and Shovels and Rope.